The Centre for Brain Research is a unique partnership between scientists, clinicians and the community. Established in 2009, the centre excels in world-class neuroscience research carried out by cross-faculty research teams, alongside clinical collaborations with leading neurologists, neurosurgeons and physicians in New Zealand and around the world. Scientists, doctors and students work at every level, from the laboratory to the clinic to the whanau and community. By working together the CBR aims to provide a brighter future for people and families affected by brain disease. A welcome message from the Director Professor Richard Faull and Deputy-Directors Professors Alan Barber and Peter Thorne. Visit the Brain Recovery Clinic for advanced clinical and research assessments for stroke patients. Learn about the three pillars that make up the centre and read our profile. Read about the vision and goals that drive our research partnerships. Information about our world-class human brain tissue research supported by the Neurological Foundation of New Zealand and Sir Graeme Douglas. Scientific discovery and dissemination are at the heart of everything we do. We are very grateful to the families, charities and funding agencies that make research at the centre possible. The CBR choir is a weekly community music therapy initiative for people with communication problems caused by brain disease. The CBR Gavel Club is a speaking club designed for the needs of adults with aphasia. 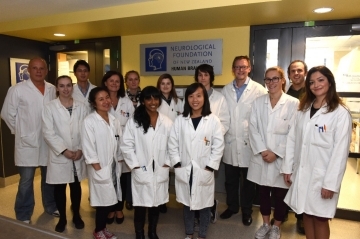 The Hugh Green Biobank (HGB), established in 2011 by Professor of Pharmacology, Mike Dragunow, is a world-leading facility dedicated to identifying new treatments for brain disorders by studying human brain cells derived from autopsy and neurosurgical brain tissue donors. The tissue microarray (TMA), high throughput automated microscopy and high content screening (HCS) facility at the CBR was established, and is directed by, Professor Mike Dragunow.